Most of these problems occur when the pollution on the roof is washed into your tank when it first starts to rain. This initial flow of water washes all the dust, leaves and other pollution off the roof and into your tank. We all know that prevention is better than cure, so it makes sense to stop pollution entering the tank, rather than trying to treat it after it has been polluted. Once a tank is polluted it can be difficult to overcome a problem. It often requires harsh chemicals, vacuuming or draining the tank completely. The A1 Filter combines these critical filtration functions into a very simple and economic device. The A1 Filter will automatically filter the rainwater before it enters your tank and keep your rainwater tank clean and safe. Adjustable First Flush: The amount of water you want to first flush will depend on the size of your roof, how polluted it is, how often it rains and what time of year it is. If it just rained yesterday then you dont need to do another full flush. If it has not rained for many months then you will want to increase the amount of water you first- flush. Only the A1 Filter has an adjustable first flush volume so you can easily increase or decrease the amount of water you discard with your first flush. Easy To Install: The A1 Filter combines all the important function into one unit so it can be installed by anyone in less than 30 minutes. It can be fitted to existing tanks, or installed on new systems. Low Maintenance: The A1 Filter will automatically clean leaves and debris from the leaf screen. The only maintenance required is to clean the filter screen and empty any build- up in the flush pipe occasionally. This will depend on how much debris and pollution your roof gets but most people do this once a year. Looks Great: The compact size and sleek design looks great compared to some other devices which are large and bulky. The solid PVC construction can be painted to any colour, unlike other devices which are made from polyethylene and cannot be painted. Suitable for All Systems- Large and Small: One unit will handle around 120L per minute which is fine for most small Rural & Urban systems or you can install additional A1 Filters on each downpipe for larger systems. Rain Head to channel water from downpipes into the rainwater tank. First- Flush Diverter to automatically flush the first dirty rain water off your roof into the diverter. Leaf screen to prevent leaves blocking pipes and entering the tank. Insect Screen to prevent insects entering the tank. What is a First- Flush Filter? Damage to pumps, washing machines and other appliances. divert the first polluted water from the roof when it rains. After the first flush is performed it automatically diverts the clean water into your rainwater tank. You Should Always Check The Quality Of The Water In Your Tanks Before Drinking It. The amount of water flushed is determined by the length of the PVC pipe attached to the A1 Filter. 100mm PVC stores approximately 7.5 liters/ meter. 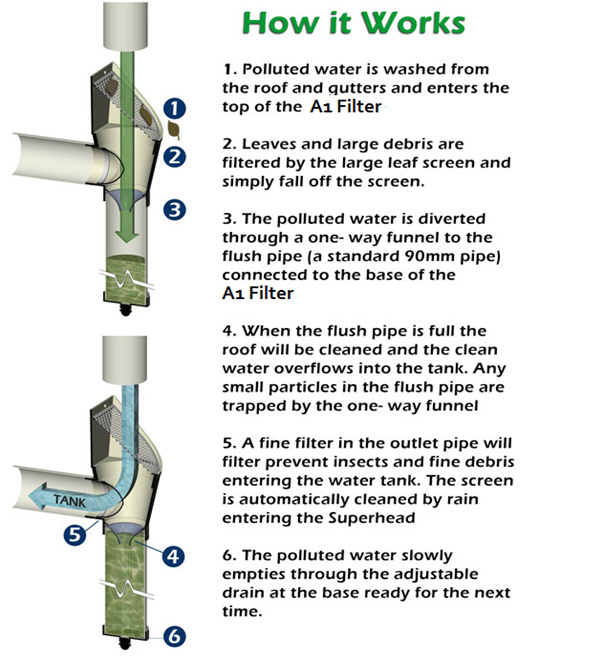 If you need to flush more water you can install additional A1 Filter to your downpipes. You can also increase the volume of the first flush pipe by increasing the length and/ or diameter of the first flush pipe you use. The A1 Filter First- Flush has a rotating outlet so it can be mounted to a wall, or directly the side of some tanks. The A1 Filter also has an adjustable drain on the flush pipe so you can maximize the amount of water you collect. During periods of frequent rain it isnt necessary to flush the full amount every time. The drain of the A1 Filter can be tightened to reduce the rate it drains and increase the amount of water diverted to the tank. A rain- head is an important part of rainwater collection. It provides a break in the downpipes so that any leaves that enter the downpipes can be cleared quickly. If blockages occur then your downpipes and gutters will overflow which can often cause major damage to your property. The first stage filter is the large leaf screen. Leaves and other debris are prevented from entering the tank by an 8mm screen. The specially designed mesh allows the leaves to fall off while minimizing splashing. The first rain is diverted to a standard 90mm downpipe (not included) so that dirt and other pollutants from the roof dont enter the water tank. Once the First Flush System has filled the internal flap will close and divert clean water through the side outlet and into the tank. A drain on the bottom of the First Flush System can be adjusted to alter the flush volume. In dry periods the drain can be loosened to INCREASE the flush volume. During periods of frequent rain it is not necessary to completely flush the whole system each time so the drain can be tightened to DECREASE the first flush volume and maximize the amount of water collected. 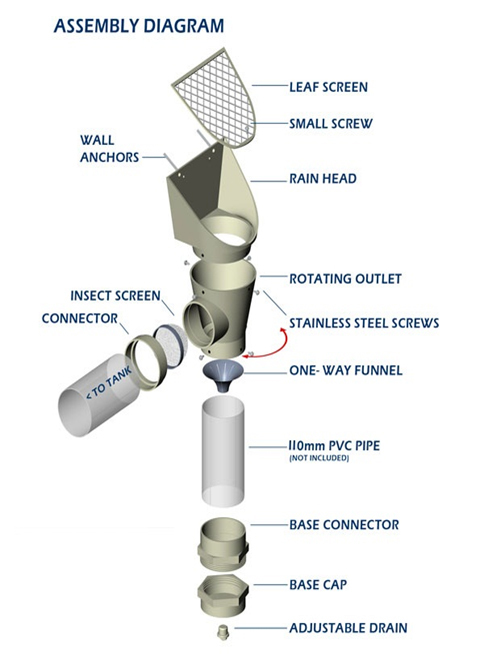 The final filtration is done with 1mm stainless steel mesh that will stop any insects or floating debris that may enter the tank. The A1 Filter comes pre-assembled with the outlet configured to the side. If another location is required simply unscrew the stainless steel screws and rotate to the required position. 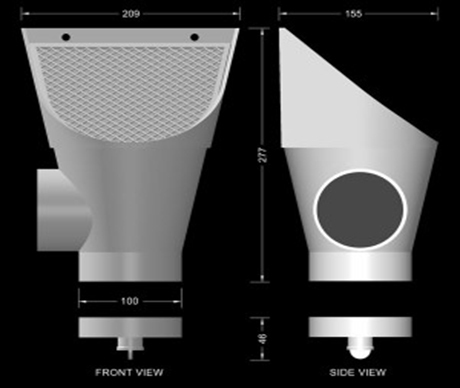 Install the insect screen so that the end of the cone shape is facing INTO the inside of the A1 Filter. This will enable it to self- clean by lying in the flow of water entering the device. 2. If required, rotate the side outlet so that the side outlet face the rainwater tank and secure using the small screws provided. The A1 Filter requires very little maintenance as the leaf and insect screens are self- cleaning, however it is important to check it occasionally to ensure it is operating properly. Over time the flush pipe can become filled with dirt and obstruct the drain. If it does become blocked, simply unscrew the drainage plug and allow any dirt to be flushed out before replacing the plug. If you have a lot of fine, floating debris then it may reduce the flow or even block water passing through the insect screen. If you have a secondary filter such as a basket on top of the rainwater tanks then the insect screen can be safely removed. Made from PVC and stainless steel.